With its bright and airy great room, sky-lit covered porches and dramatic cathedral ceiling, this 2-bedroom, 2-bath, small stone craftsman bungalow is an ideal home for those seeking a small, yet spacious, open floor plan. 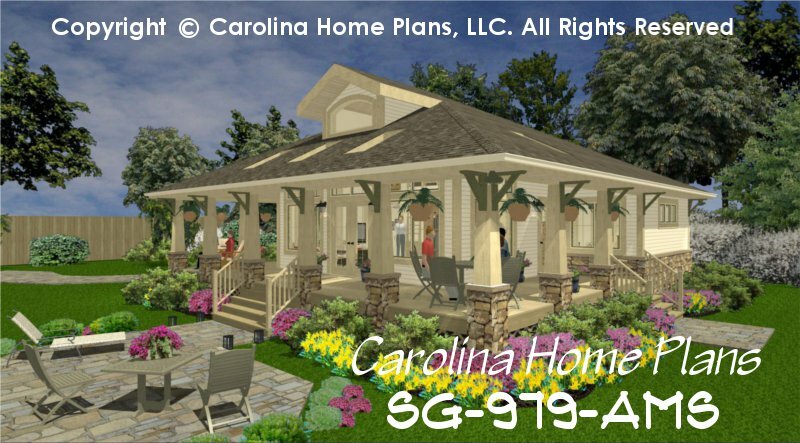 The wrap-around porch with skylights is easily accessible for outdoor entertaining and enjoyment, while providing protection without blocking light. 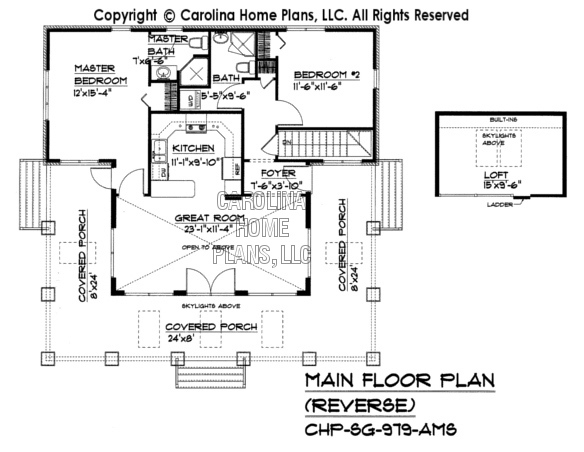 The fully equipped kitchen features ample cabinet space and a convenient lunch counter bar. 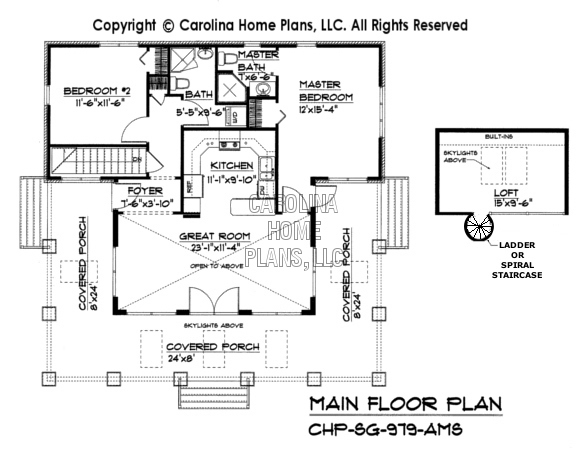 The split bedroom and bath layout, as well as stacked laundry, offer plenty of functional privacy. 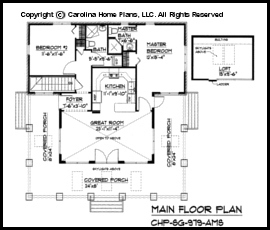 A large sleeping loft or get-away-space (accessible by library ladder, ships ladder or spiral staircase) is located above the kitchen and boasts dramatic views overlooking the great room. 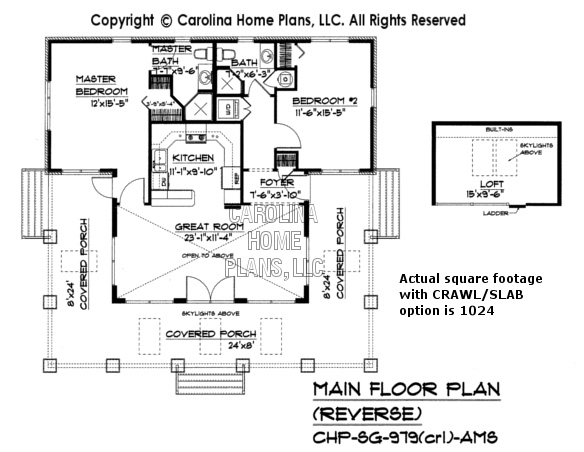 The plan has a full basement for storage or future expansion; an option for a crawl space or slab is also available (see floor plan below). Available options and pricing: See below. 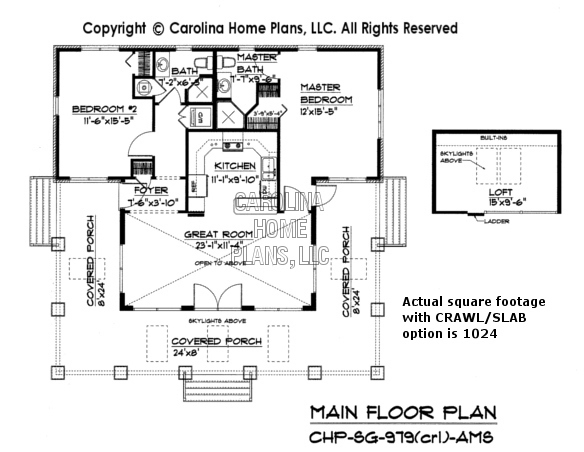 We originally designed this small stone bungalow house plan for 2 couples who decided to pool their resources in order to build their dream vacation home. Neither couple could afford a get-away cottage individually, so sharing a comfortable and unique vacation home on a small lot near the water made financial sense. 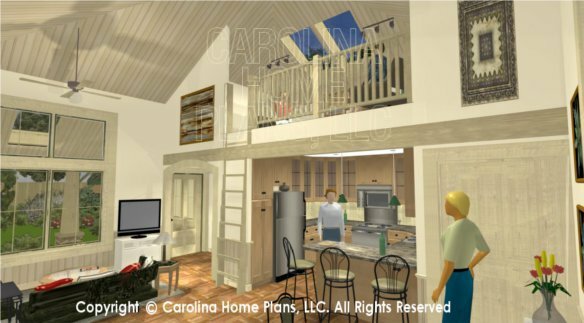 We created enough private space with a cozy loft and a spacious, open and bright cathedral great room for maximum enjoyment, allowing both couples to vacation together comfortably. Ceiling Height 8', Grt Rm: 17'-10"